Friday February 17th 1893 I helped Josie some with the ironing and got it done before noon Mary Woolf was here a little while. I spent the afternoon in town. Lee suffers very much with his hands and is growing very nervous and tired. We girls finished the rags in the evening. Saturday February 18th 1893 I was busy all forenoon with the work as it was late when we got up. I spent the afternoon in town Lee is about the same. The Dr has not dressed his hands since Wednesday but was to come tonight Will went over to Woolfs after supper. I did mending and read the papers. 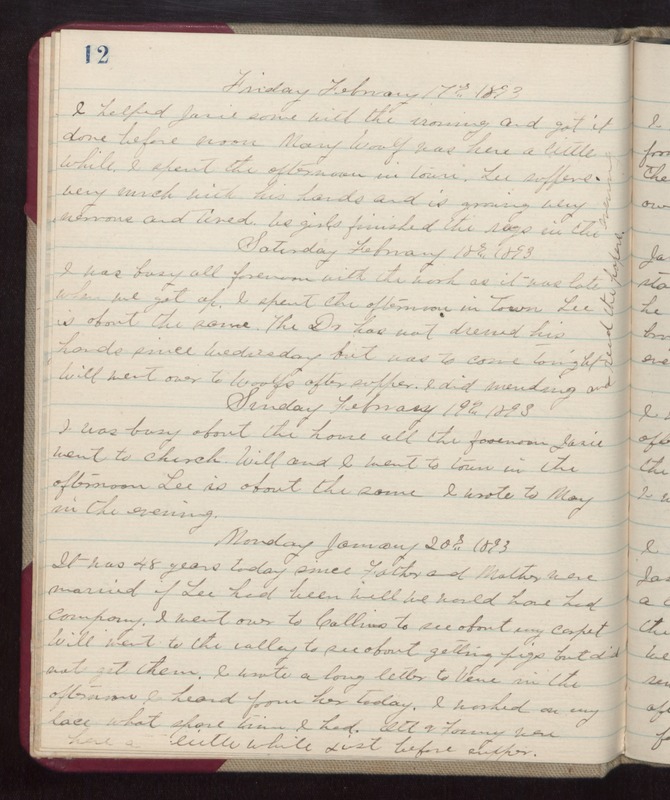 Sunday February 19th 1893 I was busy about the house all the forenoon Josie went to church. Will and I went to town in the afternoon Lee is about the same I wrote to Mary in the evening. Monday February 20th 1893 It has 48 years today since Father and Mother were married. if Lee had been well we would have had company. I went over to Collins to see about my carpet. Will went to the valley to see about getting pigs but did not get them. I wrote a long letter to Vene in the afternoon I heard from her today. I worked on my lace what spare time I had. Ott & Fanny were here a little while just before supper.